The .357 Sig line of Glock pistols including the 31, 32, and 33, besides being the only Glock models with a coherent naming strategy, are earning a unique following due to chambering in the smokin’ hot .357 Sig round. Intended to be comparable (give or take) with the long-proven .357 Magnum 125 grain loads for revolvers, the .357 Sig allows pistol makers to create auto-loaders with capacities equal to .40 S&W designs. Numerous law enforcement organizations including the Delaware State Police, United States Secret Service, Montana Highway Patrol, and Tennessee Highway Patrol, to name a few, have switched to .357 Sig configurations. One of the common elements of these groups is the desire for a round that will penetrate obstacles like car doors. While you may not encounter car door obstacles with most self defense scenarios, the extra velocity offered by the .357 Sig helps assure reliable expansion performance. And of course, it provides impressive statistics to share with your buddies at the range. 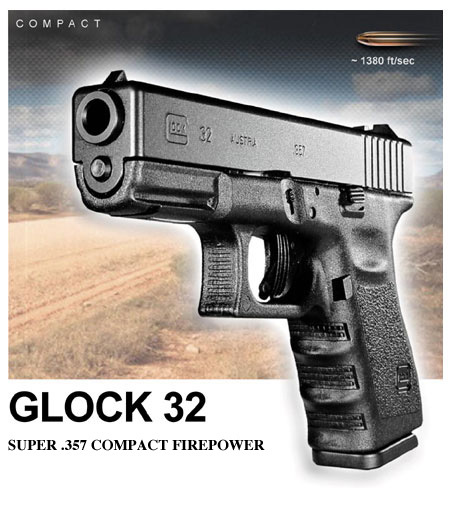 The Glock 32 is the midframe form factor, just like the Glock 19 and Glock 23. In our view, it’s the perfect size carry gun. Large enough to comfortably handle full power loads, but small enough to make concealment a realistic possibility and not pure fantasy. If you carry on a belt holster, the grip is just short enough where it won’t print too obviously out the back end – and it has room for all fingers, unless of course you have more than five per hand. The size allows it to work equally well in a belly band or shirt holster like the 5.11 Tactical Holster Shirt or a Concealment Shirt from A Better Holster. The ‘oomph, bang, and blast factor of the Glock 32 doesn’t require too much explanation. The .357 Sig cartridge out of the Glock 32’s 4″ barrel, intended to approximate the sheer awesomeness of the .357 Magnum, is formidable. And like it’s ancestor, the .357 Sig cartridge has the ability to end non-civil disagreements quickly. The flip side of the .357 Sig cartridge is ammunition cost and availability. While quality defensive load prices are more or less on par with those in 9mm and .40S&W, practice ammo is not. At our local Wal-Mart, while Winchester white box 9mm is somewhere around $.24 a round, .357 Sig white box goes for just about $.50 a round. Quite a difference. If you reload, there is no cost difference of significance. Once-fired brass online works out to about $.04 each – which is similar to prices for once-fired 9mm and .40S&W. Projectiles are also on par price-wise. For us, the cost per cartridge to reload is not measurably different than 9mm or .40S&W. One thing we really like to see in a personal defense handgun is a very forgiving attitude when it comes to operating with less than ideal shooting form. In other words, will it work properly when you shoot like a sissy? 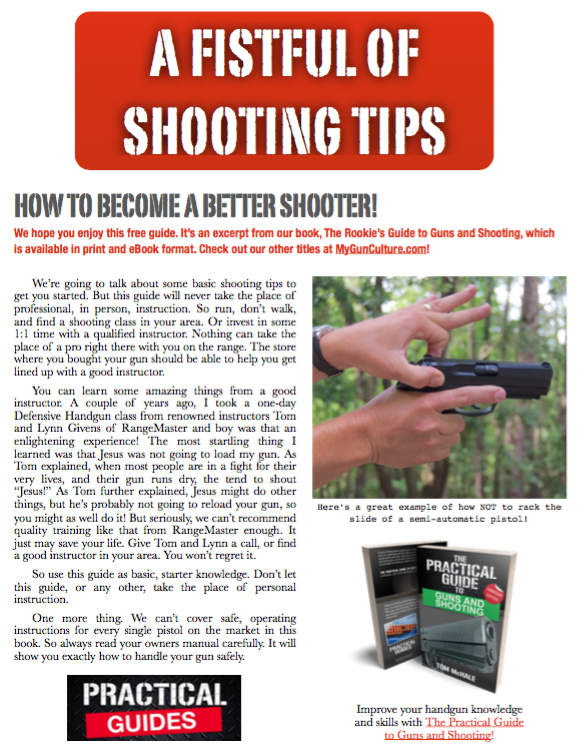 In all seriousness, the times that you would need to use the gun are perhaps the least likely times that you’ll have to opportunity to set up in proper shooting form, with a classroom approved grip and stance. Scene: Middle of the night. Sound asleep. I’m dreaming about getting one of each randomly assigned model number in the Glock lineup… Oh, and a Glock Survival Knife. Spouse: Honey, I think I hear something. It sounds like someone just broke a window! Me: Can’t you just call the neighbors and tell them to have their cats neutered? Spouse: (with more irritability and emotion this time) Someone is breaking in! Do something! Me: (finally getting my gun and finding myself face to face with a boogey man) Hey would you mind taking a few steps backwards? I need to get into a proper shooting stance so my gun will work properly. Boogey Man: Sure, let me turn the light on first though. I don’t want to trip over your shoes. I could hurt myself you know. Our point is that we like to give extra special brownie points to guns that operate without requiring a a full Muhammad Ali boxer stance and Chuck Norris grip. We want them to work weak handed, upside-down, held with two fingers, and so on. In this department, the Glock 32 really shines. Even more than a Glock 22 recently tested. We suspect it’s due in part to the bottle-necked .357 Sig cartridge shape. While we can make a Glock 22 fail with poor shooting form, this is really hard to do with the Glock 32. Well, we don’t have a lab, or facilities for producing large quantities of ballistic gel for performance simulation. And ‘she’ won’t let me do that in her kitchen. We’re a low budget operation after all. However, we do have lot’s of empty milk jugs as there are a couple of teenage kids around this household. So while blowing up plastic jugs full of water may not provide a gnat’s spit worth of scientific evidence, we sure can amuse ourselves doing it. Note the beautiful expansion from the recovered 125 grain Speer Gold Dot in Figure 1. Pretty isn’t it? We’re going to have to give our friends at Hot Caliber some of these to mold into fine jewelry pieces. The Glock 32 is one of those designs that really hits the nail on the head with respect to balance. The size is just small enough for easy carry and concealment. The size is also just big enough for good grip and control. And the caliber loading is aggressive but not too much so for the form factor. We really like it. The neat thing about the Glock family is that if you like a particular form factor, you can then select your caliber. The Glock 19 and Glock 23 are identical in size and offer 9mm and .40 S&W respectively. The other standout points are reliability and ease of maintenance. Try as we might, we can’t make this one malfunction. And the finish is rock solid. Between the tough polymer frame and Tenifer finished slide, it requires no special care. Rain, mud, sweat – no problem. Especially considering the price, you can’t go wrong. We highly recommend it. 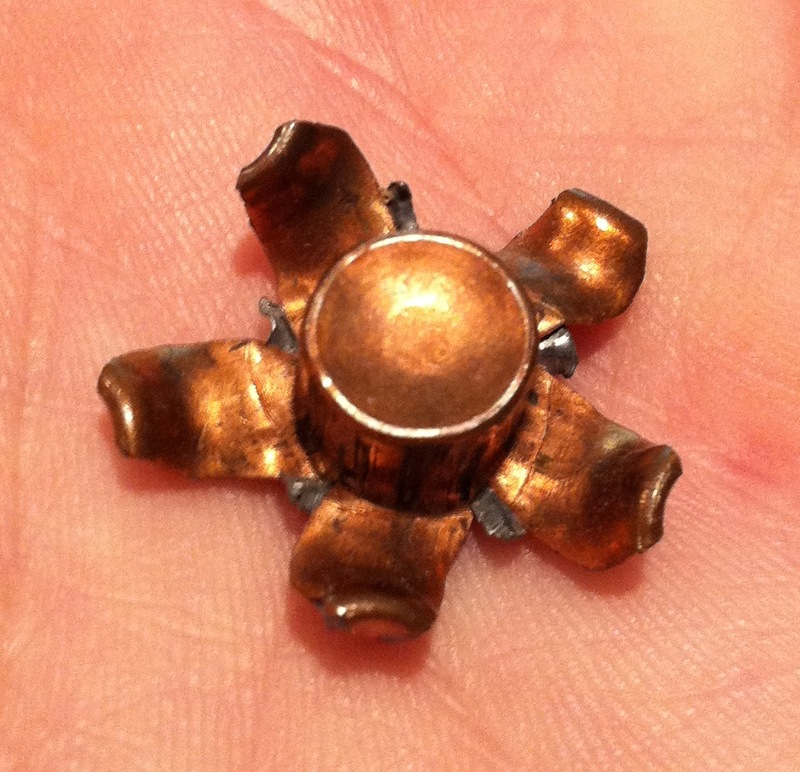 The blast of this gun in .357 Sig is just awesome! Love the noise, recoil, and feel of raw power. Manly stuff. Grrrrr!!! Although the recoil is noticeably snappier than a .40 S&W gun, it’s perfectly manageable given the size of the frame – although compact, you can get a solid two-handed grip. I’ve never been a Glock person because they look too industrial and manly for my taste. I have to admit though, that once I shot it, I really liked it. Great size, not too heavy. The shape and grip size make it easy to control.I’m a Steel Challenge shooter and I’m going to compete with this one for the next few matches – just for fun. He’s going to load me up some reduced power .357 Sig rounds so I am not at too much of a disadvantage against all those wimpy 9mm shooters. I too am now a proud owner of the 357cig. Someone help me. Took it out for the first time, shot 100 rounds. After about 70, she started to JAM !!. What!!! It’s like it has a mind of it’s own. One minute it’s fine and the next, JAM. Went back to the store I purchased it from and they are saying that it’s me. Confused. Can someone assist me because i was under the impression that GLOK is not particular with ammo, and doesn’t JAM. I beg to difer. Not sure what to do here. It even jams on initial pre-load. Hi Jim – That sounds extremely unusual. Glocks are notoriously reliable with different sorts of ammo and due to the bottleneck cartridge of the .357 Sig, the Model 32 tends to be even more reliable – especially with feeding. What type of jam? What type of ammo? Do you have any other Glocks? What other guns do you shoot regularly? Did you buy this gun new or used and is it a Generation III or Generation IV? Tom, Thanks for the reply, It’s as if the spring is week in the Mag, the bullet doesn’t want to come all the way up enough to go into the chamber, Brand New Gun, After writing this I found a U-Tube Video, and the guy was having the exact same issue. It’s the Magazine…… On the tip of the loading end there is a #,1 or 2, He shot 1200 rounds, 600 w/ the # 1 and 600 w/ the #2, The 1 didn’t misfeed at all and the 2 did it 2-3 times with every full clip. I am now on the hunt for some #1 Magazines. I think I am going to contact Glok. They are probably aware of it by now, The video i watched was done in Sept/Oct of 2011. Mine shoots well with either cal. But I do prefer the 357. I just like that extra punch! I bought a Glock 32, 357 with 3 magazines ,but later on i observed that it’s written 40 instead of 357 over the 3 mags. My question is : it will work normally without any problem ? Yes, the magazines are the same between the .40 S&W and .357 Sig, so you can use either. Just be careful not to mix up loaded mags if you own Glocks in both .40 and .357 calibers! I used to have a g32. Loved it. No issues. Great powerful cartridge. Did backyard testing shooting through phone books with the 32 and 357 mag side by side. Very close. Hard to tell whi h was which in the testing media. Very impressed by the 357 sig. Later shot a very large 8 point buck with the 32. One shot. He expired quickly. Wow awesome cartridge. you must have felt really manly making a deer “expire” quickly. Does the term “ugly american” ring a bell? is your wrist hurting or it always limp ? mr. snowflake ? you gotta be kidding ! you with peta ? or aspca ? you wanna save gaia too ? Everyone has their own view of what the perfect handgun is. G32 is close to that for me. I was able to trade for one that included the 357 sig, 40 cal and 9mm (wolf) barrels. The G32 uses G19 magazines too. And the 40 cal magazines generally but not always feed 9mm. So, I have 3 calibers of the same pistol. I’m also thinking of getting a mech-tech carbine conversion sometime. It’s hard to beat a Glock, a Dairy Queen ice cream cone or a Toytota.